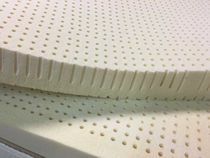 Exclusive purchase of Wavy Dunlop latex 2" toppers made by Latexco in their U.S. facility is an excellent way to soften up most beds without spending a lot of money. This is a line poured design and unlike traditional latex has no holes. Made with a 50/50 mix of natural rubber and synthetic rubber this topper offers an excellent value at only $119 Queen size. 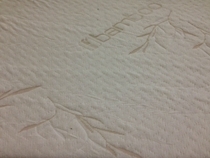 Stack 3 of them up and you have a real latex mattress for less than a cheap poly foam bed! Supplies are limited so act fast. This topper is designed to offer 2 different feels based on whether the waves are up or down. Waves up for a slightly firmer feel and waves down for a softer feel. 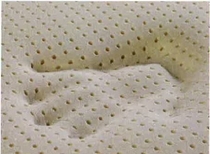 Match this up with one of our Certi-Pur-US foam base cores and a replacement mattress cover and you have an excellent DIY bed at an unbelievable price. Latexco is the largest finished latex producer in the world with factories in both Belgium and the U.S. and are innovators in their field. This new Wavy latex is a follow up to their Puralux line also found on our site. 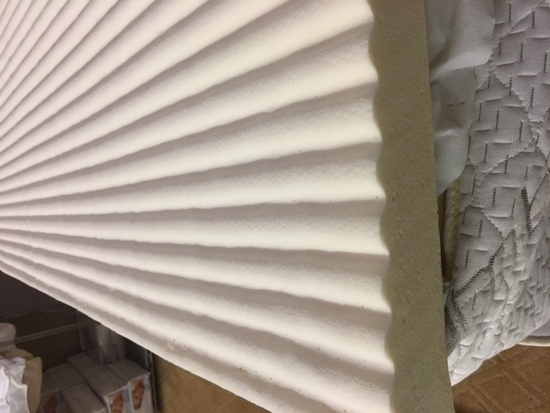 For the money this 2" latex topper cannot be beat and will offer years of service either on top of your existing bed or used as a component in a Do-It-Yourself Mattress design. The ILD for this product is #24. Like all of our latex products this is Oeko-Tex 100 certified to be free of harmful chemicals, it's hypo-allergenic, breathable and extremely durable. Roll packed and shipped to your door via UPS. Comes with full 5 year warranty.